Anyone have good success with one of these babies? Why is the picture a silhouette of a cat? Bout to use mine for the first time tonight. But, it's got the best stats and abilities of any Find Steed mount, so, I imagine it'll work well. Paladin with find steed, should be a go to thing I think. Excellent stuff. 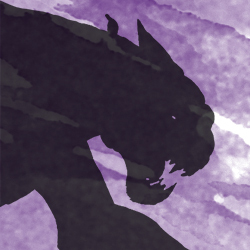 As far as I know, it's because the cat silhouette is just the generic image used in the Monsters section if there is not an image assigned to a particular entry. Like how in the Weapons section most of the entries have the sword silhouette, even if it is an axe or a spear or whatever. How did it go? Any advice or tips and tricks for someone considering playing a Paladin with Find Steed sometime in the near future? I can't remember how that night went, but having a mount is situational. Many advantures, I reach a point whenre my Warhorse can not continue, and I unsummon him. However, for those times you can use em? I've used it to just dash while I slica and dice an entire charging line. I've telepathically had it charge an enemy caster when I was dismounted, breaking the caster's concentration. situational, but extremely awesome when you can use em. I named mine "Nutmeg"! A sturdy friend to fight evil with my paladin.